Have a heart for Chess! It might save a life. Here’s Why: Unfortunately, too many of us have a loved one affected by heart disease or stroke. To help stop this, George Duval ( aka Blunderprone) along with others in the chess community will be participating in this year's Start! Heart Walk on September 12, 2009 benefiting the American Heart Association. You can help raise funds and protect those you love by participating in something fun and chess related. Fee: $20 for both BCC and Non-BCC members, remember this is a fundraiser. Make checks payable to American Heart Association.Your contribution will make a difference in the fight against our nation's No. 1 and No. 3 killers: heart disease and stroke. Where: Boylston Chess Club; 240 Elm St., Suite B9; Somerville, Massachusetts 02144(617) 629-3933 SUNDAY FREE PARKING ! 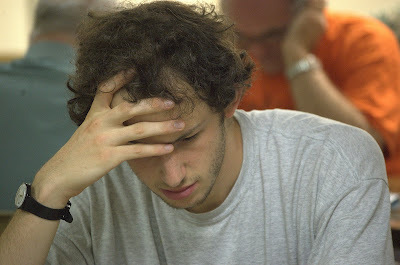 When: Sunday August 30, 2009 at 1PMRegistration: 12:00 – 12: 45.“Blunderprone” promises to make this a fun event for all levels of expertise as he guarantees no one will lose any USCF rating points. Have we grown as a civilized society? In a Washington Post article [Oct. 6, 2007] World War II veterans “lamented the chasm between the way they conducted interrogations during the war and the harsh measures used today in questioning terrorism suspects”. I wanted to write an essay about local players that listened to music while they played in tournaments and discuss their music preferences and hypothesize about the best music to play chess by. What seemed like a fun and interesting essay turned out to be not so easy because many players were very guarded about what they liked and some were willing only "to speak off the record". Also came up an interesting situation in US chess: I found out that the USCF is trying to discourage the use if MP3/iPod players during tournament games. This is to the consternation of some local strong players. I can only imagine that the USCF thinks that someone might try transmitting information to a player that appears to be listening to music. The sensitivity is quite high among players having the possibility not being allowed to be able to listen to music while playing. I have noticed many players who's lips are silently moving to their tunes, players of all strengths btw. Occasionally when the chess hall is noisy, usually because there is a disturbance outside the hall, I will don my earplugs and listen to the opera Marriage of Figaro, which I have heard so often its more like white noise than music to me. I usually resort to my MP3 player when that late Saturday night game is beside a wedding reception at a hotel. Or when at the BCF the MP3 goes on when the Improvisational Comedy Group, located across the hall from the BCF, decides to practice. One time while directing a tournament, I went over to them to ask them to please quiet down. What ensued was me teasing them by saying it was unethical for an improvisational group to practice. They informed me that what they work on, is to learn to provide openings for their comrades, in order to keep a skit going. I recommend that they Google Reuben Fine and openings. Anyways there is much sensitivity about the use of iPods and mp3 players and I wouldn't be surprised but saddened to see rules in the future. I know FIDE prohibits having a player posses a cell phone in the hall or using a cell phone while their game is in progress. I hope the USCF continues to allow people to posses a phone, because as mentioned before, I think cell phones give people more opportunity to play, not less, especially kids. And I don't know what reasonable mechanism you would have for enforcement. I think all these "anti technology" rules will not stop the non sportsman from cheating. What about good old fashion talking with each other during the game? I think we should discuss among ourselves the importance of high ethical standards of sportsmanship in chess. Not to say that cheating hasn't happened, but I hope we don't have to excluded all electronics from the chess hall. This would penalize 99.99% good honest folks from leveraging their e-stuff. I think that a director should be allowed to ask and inspect anything a player is using or referring to during a game to insure they're not getting coaching or chess related info. I think that should be sufficient. What do you think about listening to music while playing chess or other e-stuff? The 16th Annual Charles Drafts memorial tournament drew 32 players, including some new faces and absent some regulars. NM Lawyer Times won the open section with 4.0 of 4. Gabe Frieden and Dan Leach shared second place honors with scores of 3.0. Gabe is playing well, having just shared 1st place in the U1900 section of the 39th Continental Open in Sturbridge last weekend. The under 1900 section was won by young Ben Yuan with 4.0. 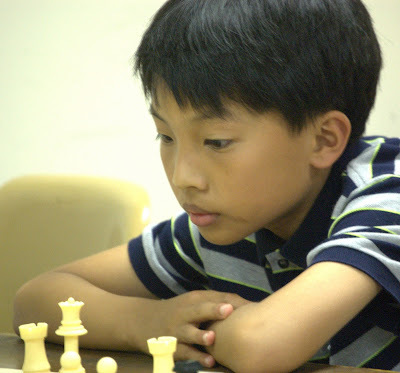 He had come to the US from China two months ago to join his father, attended the Boylston chess camp with Jacob Rasin last week, and played and won his first four tournament games for a provisional rating of 2142. The event was directed by Bernardo Iglesias and the prize fund was guaranteed by Walter Driscoll as he has done for 16 years to remember Charlie Drafts You may not know that Walter is a chess traveler, an actor, and a stand-up comedian. You can catch him at the Burren, on Elm St. near the club, at 10:00 pm on Sept. 9th. Join IM David Vigorito for a brief lecture with a Q&A followed by a Simultaneous Exhibition starting at 1 PM at the Boylston Chess club (BCC). The proceeds will go to help the American Heart Association. I know Post Hoc Ergo Propter Hoc is a fallacy and cardiac problems are the leading cause of death in the United States. Still Bill Wall's listing of the causes of death of some chess players makes the the August 30 lecture and simul to benefit the American Heart Association even closer to the hearts of all chess players. At least it is morbidly interesting. Jose Capablanca (1888-1942) - died after watching a skittles game at the Manhattan Chess Club in 1942. Klaus Junge - German army officer killed in action in 1945. Paul Keres (1916-1975) - died of a heart attack returning home from a tournament in 1975. Nikolai Krylenko - executed in Stalin's purges in 1938. Paul Leonhardt (1877-1934) - died of a heart attack while playing chess at a chess club in 1934. Julius Perlis (1880-1913) - died in a mountain climb in the Alps in 1913. David Przepiorka (1880-1940) - died in a mass execution outside Warsaw in 1940. Gideon Stahlberg (1908-1967) - heart attack during the 1967 Leningrad International tournament. Karel Treybal - died a victim of the Nazis in 1941. Alexander Zaitsev - died of thrombosis as a consequence of a leg operation in 1971. Stefan Zweig (1881-1942) - committed suicide. John Curdo, the New England chess legend, was recently profiled by Mark Arsenault for the Boston Globe. Though he doesn't venture into Boston for tournaments much these days - he used to be active at the BCC and the Metropolitan Chess League - he still plays all around Mass - most recently in Sturbridge. 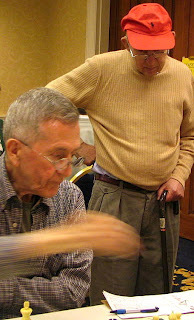 John Curdo and Harold Dondis have been friends and titans of New England chess for many decades. Let's say you play Monday evening at the Boylston, then Tuesday at MetroWest, and then in the BCC Thursday Night Swiss -- and you need a chess fix to tide you over till the Saturday tournament at the Boylston. Nick Sterling reminds us that the Waltham Chess Club meets every Friday at 7. You are invited to play. Remember, a day without chess is like a day without sunshine. Are any of you interested in being on the e-mailing list for Waltham Chess Club? We meet every Friday from 7 PM on at the IBM Building in Waltham, and MASTERS PLAY FOR FREE. I wish you the best of luck with your event on 8/30. On vacation in California I realized how similar cosmopolitan cities are all around the world, yet each government has its ways of dealing with immediate problems that give them uniqueness. In California you have to fit all your trash in one of three "official" bins (trash, recycle, or lawn clippings) and a truck with a gigantic robotic arm rushes down the street flipping the barrels over its top. In the countryside of Maine you are responsible for your personal trash and recycling. My son said they never really throw anything out in Maine - they hold a yard sale and whatever is left stays there. While vacationing in Maine in the Moosehead region, recycling was at a local home. Years before Kramer and Newman of Seinfeld fame tried to leverage the +5 cents between state lines, my two boys wanted me to fill all voids in our trailer with bottles to recycle in Maine to get the extra nickel. In the yard of this recycling center rested a surplus military deuce and a half with a For Sale sign and a warning in crayola on the fender "needs brakes". For about six consecutive years that truck rested in the driveway. I regret not photographing it before it was gone. I wonder if you traded in that old truck if you could collect $4,500 in cash for clunkers. Or go in and buy a clunker for say $800 and flip it? I bet Seinfeld could do that plot justice. I was thinking how "green" chess is compared to other recreations. Although most clocks now require batteries, when compared to most pastimes chess, go, and bridge are very green. Is chess greener than golf? This is usually a great tournament for several reasons: guaranteed prize fund, turn-out, competive level, and as a event honoring a remarkable man. Walter Driscoll has for 16 years honored and remembered his friend Charles Drafts by helping sponsor a tournament for which he personally guarantees the prize fund. This Saturday the ... Annual Charles Drafts Open is being held at the Boylston Chess Club. Charles died several years ago and so for newer members of the club and the broader readership of the weblog I thought it might be worthwhile to briefly review his story. Charles was a disabled, double-amputee living in the housing projects in Mission Hill. 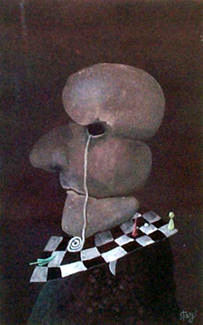 He loved to play chess but his condition made it difficult for him to come to a club or attend tournaments. At some point in time he contacted the BCC to see if any players would be willing to come to his apartment to play. Over the years several heeded the call, but in particular club member Walter Driscoll was a frequent visitor. I believe Walter was also the driving force behind the Charles Drafts Open. 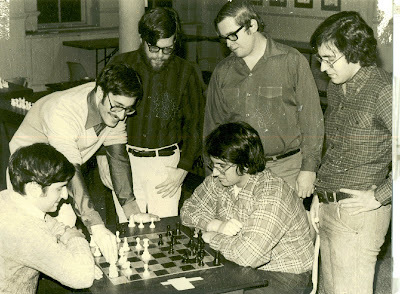 At the beginning and for many years, the tournament was held at Charles' building in Mission Hill so that at least one time a year Charles would have an opportunity to play in a "traditional" chess tournament. Since his death, the tournament has continued at the club as a memorial event. 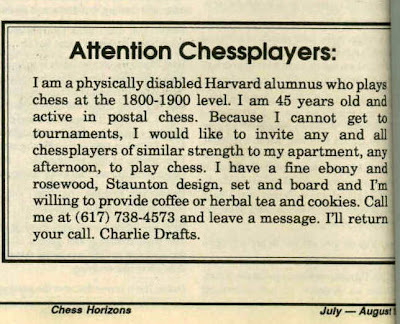 BOSTON -- A disabled man who became ill while logged on to an Internet chess site reached out to fellow players from around the world for emergency assistance. Charles Drafts, a double amputee who types using a stick in his mouth, was playing chess in cyberspace Saturday on the multi-use World Wide Web site where 159 others also were logged on. Suddenly, he sent out this message: "i'm having physical illness problems and need help." 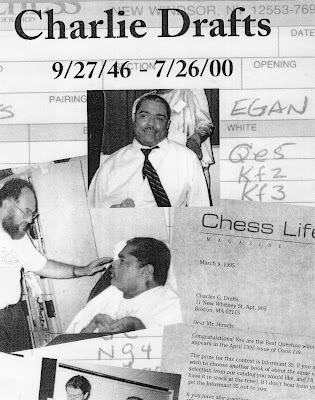 "He was starting to have some really bad feelings, shortness of breath and dizziness, and he typed in a message to all our members," said Daniel Sleator, a computer science professor at Carnegie Mellon University near Pittsburgh who founded the Internet Chess Club. "It took a little while to know whether it was serious or not because there's an awful lot of kidding and bantering that goes on," Mr. Sleator said. "At first, I think some people were thinking it was a joke. But others realized it was a serious thing and started getting the information right away." Mr. Drafts managed to type in his address.... while several users tried to find out what symptoms Drafts was suffering, Andy McFarland of Owensboro, Kentucky, was calling Boston's emergency medical services on his second phone line. "When he finally got through, he told dispatchers where he was calling from and explained the situation," Howland relates. 'I think I lost them for just a second,' McFarland said. 'It's not something they get every day.'" ...firefighters rushed to Draft's home, but no one answered the door. They called McFarland back to verify the address. McFarland told the wire service, "The last thing I heard them say was, `We're going in,' and they hung up." ...a short while later Boston firefighters broke down his door to get inside. They rushed the 48-year-old man to Beth Israel Hospital, where he was listed in stable condition ..., suffering from an undisclosed ailment. About 20 minutes later, a Boston dispatcher called to tell McFarland that they had found Drafts inside and that he had needed help. Here is an update on the Blackstone Chess Festival. Festivities begin Saturday August 22nd. The club should be open around noon, and the simul with David Griego is scheduled to begin at 2pm. I have attached the latest flyer [see below]. 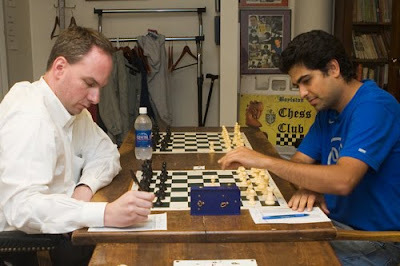 This is a great way to beat the heat in the air conditioned comfort of the Blackstone Chess Center. We have a cooler full of cold beverages, and Kafe Lila has the best iced coffee in Rhode Island (cold-pressed), along with home made ice cream, ice tea, and fresh squeezed lemonade. Also, it's not too late to get in on the Thursday night 3-round swiss. Arrive by 7:30, as we are starting round one this Thursday. We are allowing a single bye in any round. Last round bye must be declared when you sign up. We have 4 entries already signed up, so we will start a 3-week cycle this Thursday (8/20), and continue with the next cycle on Sept 10th. 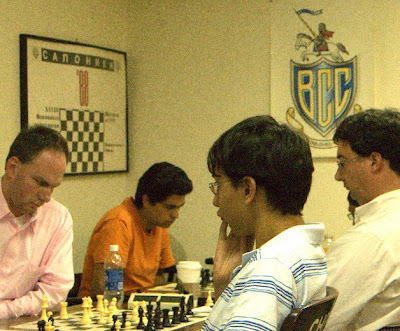 The 2009 Blackstone Chess Festival opens Saturday August 22nd with a simultaneous exhibition by Senior Master David Griego. Arrive by 2:00pm if you want to play. Fee is $7, $5 for club members. 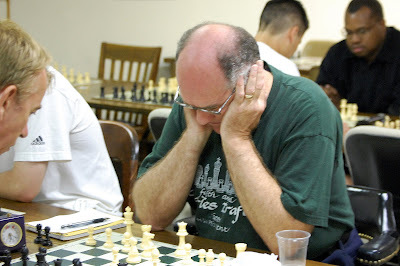 David Griego has won numerous chess titles, including the US Junior Open, 10 Rhode Island Championships (the first at age 14), and 3 New England Championships (back to back in '84, '85). Just show up at the Center, or send a message to director@blackstonechess.com to reserve a spot. Spectators are welcome to come watch the Masters Blitz, Friday, August 28th, at 7:30pm. Game/7 double round robin. Participants include Senior Masters Jorge Sammour, David Griego, and Denys Shmelov. This is the first in a series of Blackstone Masters and Experts blitz competitions. Jorge Sammour and Denys Shmelov are members of the Boston Blitz USCL team. The Blitz made it to the USCL finals in the past two seasons, but lost to the Dallas Destiny in an exciting but disappointing tie-break playoff. Six local masters are expected to be competing in this event. The Blackstone Chess Festival Open will be held Saturday August 29th. This is a 4SS in 2 sections, Open and Under 1700. Registration: 10:00am-10:30am. Time control: Game/60 (Game 55, 5 sec. delay). Entry fee: $25, advance entry: $20. IM/GM Free! Prizes: $400 based on 20 entries. Two or more members of the same family or chess club can enter together and receive $5 off each entry. This can be in addition to the $5 advance entry discount. Schedule: Round 1: 10:30am, Round 2: 1:00pm, Round 3: 3:00pm, Round 4: 5:00pm or ASAP. optional, but helps to support the Chess Center. Introductory 6-month membership is only $20. Directions: From Massachusetts/I-95 South, take RI exit 27, then take a right onto George Street. From points south/I-95 North, take RI exit 27, and take a left at the second light. Go past the Comfort Inn, to the end of the road. Take a right, and enter the parking garage at the bottom of the hill. The entrance is on Main Street. Kafe Lila is on the street level, the Blackstone Chess Center is down the stairs, and to the right, Suite B3. The address is 250 Main Street (The Grant), Suite B3, Pawtucket RI 02860. Chess books and equipment are available for sale. Air conditioned! At last evening's board meeting, Bernardo Iglesias, head of the tournament committee, brought up several issues about the championship cycle - Weaver Adams, Reubens-Landey, and the Championship itself, and also the Hauptturnier, which runs parallel. The Hauptturnier I believe was initiated by Bob Fuhro to provide a challenging event for the best club players who hadn't qualified for the Championship. After extensive discussion the board voted to limit the Hauptturnier to the 10 highest rated players who register. There is a signup sheet posted in the club - if you are interested please sign up and give your phone number and email address. If you can't make it to the club, you can email oresick@bu.edu or biglesia@bu.edu. If more than 10 players register, the lower rated players will play in a Swiss or Round Robin. Alex Cherniack and Bill Kelleher suggested the corresponding tournament would be for, ... what's the German word?... for patzers. So, if there is sufficient interest, we will sponsor the first annual Patzerturnier. I think I might try to register for that one directly - I should qualify. 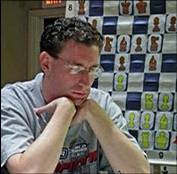 In a skillfuly played endgame with short time Greg Kaden edged Farzad Abdi to win his fith victory and clinch sole possesion of 1st place in the 2009 Reubens Landey. He will be invited to play in the BCC championship beginning Sept. 14. Farzad ended up with 3.5, as did Simon Warfield and Ken Newman. There is a possibility that one of the secondary leaders might also be able to play in the championship, but the ruling will be carried to the board meeting on Weds for a decision. Congratulations to the leaders and thanks to all for playing. See you at the Hauptturnier? Are you a chess enthusiast who wants to do a wife swap? ABC's primetime series "Wife Swap" is currently casting its fifth season and looking for unique, outgoing families with a defined family philosophy to take part in the show. Families who participate in this documentary-style program are given a unique opportunity to share their beliefs and lifestyles with another family. It is truly a once in a lifetime experience that can be life-changing for everyone. Each week on Wife Swap, the mothers from two families with different values and belief systems will exchange lives. It's an amazing family experience and opportunity to learn how others lead their lives. Half of the week, mom lives the life of the family she is staying with. After making her observations, she introduces several "rule changes," where she implements rules and activities that are important to her family. It's a positive experience for people to not only learn but teach about other families and other ways of life. Wife Swap airs on Disney owned ABC television on Fridays at 8 pm. If you are a family with at least one child over the age of 5 living and you think your family would be a good fit for the show, contact us to be a part of this show. *If you refer a family who appears on our show, you will receive $1000 per family. The $10 Open remains one of the most popular tournaments sponsored by the BCF. The club provides a stimulus for one's chess budget which works as well as cash for clunkers. Denys Shmelov (2506) won the open section (n = 27)with a perfect 4.0. Marc Esserman (2456) and Carey Theil (2261) tied for 2nd with 3.5. In the U1800 section (n = 16), there was a 5-way tie with 3.0 points: Amrit Gupta, Bernardo Iglesias, Ryan Ottavanio, Steven Stepak, and Matthew Reale-Hatem. Directed with finesse as usual by Bernardo Iglesias. Just wanted to let you know that I recently made a Chess Database application for the iPhone/iPod Touch that you can download from App Store; just go to the App Store and search for "ChessDB". Its kind of like ChessBase for the iPhone. It comes with the databases of games of Morphy, Fischer, Kasparov, etc., and you can download any database you have onto your iPhone too. Anyways, enough advertising; if any of you decide to try it out, let me know what you think! When the Massachusetts polls closed on November 4, 2008, Christine Dorchak was among a crowd of 100 people anxiously awaiting the results at Jillian’s in Kenmore Square. Their butterflies had nothing to do with the outcome of the presidential race. For more than a decade, Dorchak, cofounder and president of the national nonprofit GREY2K USA, had been waging a fight to end dog racing in Massachusetts. She had crafted a ballot measure that would phase out the practice by 2010, and her group had campaigned hard all year. Now, all they could do was wait. “We were on pins and needles,” Dorchak recalls. Just after 10 p.m., a local television news station announced the results: the measure had passed with 56 percent of the vote. As the crowd of supporters cheered, Dorchak ran to embrace a friend with such exuberance that the two fell to the floor. “I just couldn’t believe that we had finally defeated the cruelty of dog racing in our state,” she says. The victory was the culmination of more than just a long political battle — it capped a personal struggle as well. In 1992, Dorchak (COM’90) was hit by an MBTA train as she crossed Comm. Ave. with her dog, Kelsey, one morning before work. She suffered severe head injuries and broke two bones in her back, and her spleen was crushed. Worse, her memory had been wiped clean. She didn’t recognize her parents, her brother, or her boyfriend. She could no longer speak fluent Spanish and French, as she had after studying foreign languages at BU. She volunteered for animal welfare organizations and in 1998 became director of research and public outreach at the New England Anti-Vivisection Society. About the same time, a friend told her about a group opposed to racing — they believed it was cruel to the dogs — who demonstrated every weekend outside Wonderland Greyhound Park in Revere, Massachusetts. 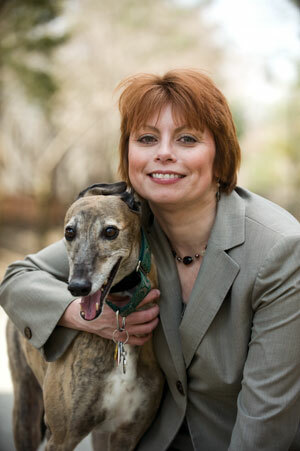 Dorchak joined the pickets and supported the group’s ballot initiative to halt dog racing. The measure was narrowly defeated in the 2000 election. The following year, Dorchak and two other members of the group formed GREY2K USA and got back to work. In 2006, they drafted a similar measure, but the state Supreme Court struck the question from the ballot, declaring it was overly broad, she says. In last night's round 4 of the annual Reubens Landey tournament, Gregory Kaden faced off with Simon Warfield and at the end of the day remained undefeated. Farzad Abdi took out Zaroug Jaleel to enter round 5 with 3.5 points, so next week it is Farzad Abdi vs Gregory Kaden. The winner of Abdi-Kaden will be invited to play with the masters in the annual Boylston championship. Kaden entered the Reubens Landey rated at 2178 and now after 4 rounds is 2204. If he wins, in addition to the invitation he would earn the National Master title. 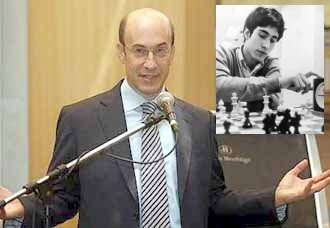 Here is an interesting profile of Ken Rogoff, a self-described recovering chess addict whose chess and academic careers have been intertwined. Rogoff used to play chess at the Boylston Chess Club. Below, he is 2nd from the left in this 1975 photo. LESS than one month after he made the above remark in a Singapore conference organised by RAM Holdings Bhd, investment bank Lehman Brothers collapsed on Sept 15 and Fannie Mae and Freddie Mac were nationalised on Sept 10. And Harvard economics professor Kenneth Rogoff, who predicted the fallout in the financial sector, went into hiding for two weeks. Prof Kenneth Rogoff the present-day economic guru, and (inset) as a 16-year-old representing the US in the under-21 chess championship. Rogoff did not realised the impact his views had around the world until he was mid-flight to Sweden via London. He happened to glance at the headlines of The Guardian a fellow passenger was reading. “I was shocked and nervous when I saw the headlines. I kept replaying the statements I made in Singapore. Could the press have misquoted me? It seemed so extreme when you see yourself on the newspapers. I asked myself, what is going on? Did I say something I did not mean to say? That was one year ago. Last week, on July 20, during the first year anniversary of his remarks, Rogoff was in Kuala Lumpur for the first time, in another seminar organised by RAM. The fear is replaced by a glint of mischief in his eye, mixed with amusement. He laughs and jokes about that incident which sent him into hiding for two weeks. Rogoff enjoys his work tremendously today, not because of how things have turned out in the global financial landscape. But 15 years ago, when he was doing theoretical work, he would not have said that, he says. Today, he writes, teaches, speaks publicly and is consulted all over the world. Rogoff comes across as consistently controversial. He dropped out of high school at 16 to play chess, which he had earlier found difficult to grasp. His father, a radiology professor had given him a chess set at six, but it was a game he did not take to until he was in his teens. When he quit school to make a living out of chess, his parents were dubious. “I did not do it for the adventure. My parents, being true liberals, insisted on living in the city where their children could have a genuine American inner city high school experience. It was a good place to learn how to deal with all kinds of people but I was not learning anything else. But that was not the reason I dropped out. I was already a top chess player and rising very fast. I really enjoyed the game,” he says. At a time when he was touted to be the top player in the United States, living off his prize money, he quit chess to go back to college. He dropped out of graduate school because he lacked direction in life only to later become among the top student in the field. Today, Rogoff is one of several economists with a large following around the world. He writes, speaks publicly and is consulted for his views. Ironically, Rogoff did not embrace economics easily until he started his first job with the Federal Reserve. The choice of studying economics was itself not a conscious decision. While playing chess in Greece, he had, at 17, befriended John Geanakoplos (now Yale economics professor). But the real evangelist was Jeremy Bulow (now Stanford economics professor) who had a huge influence on his decision. The three were to become roommates in Massachusetts Institute of Technology (MIT) graduate school. But Rogoff continued to be torn between being a professional chess player and research economist. He repeated his high school experience when he dropped out of MIT after one semester. One year later, he returned to MIT and was glad they took him back. He also counts himself very fortunate that Yale accepted him when he decided to return to college despite dropping out at 16. “It was only during my first job at the Federal Reserve that I embraced economics and took a professional view of the whole thing. “I’m not someone who instantly picks up on everything, but I am patient and persistent. It takes me a long time to get a grasp of things. Maybe that’s why I am able to explain things clearly because I need a lot of time to really understand something myself. Until today, his ties with chess continue to feature. Rogoff still gets letters from some of the top 30 players seeking advice on how to quit chess. “I cannot play chess now because if I play, I become an addict. I’m always asked why I quit and how I quit. “I quit because I wanted to do something more with my life. I feel now I have done that. It was not easy for me to say that 15 years ago when I was doing theoretical work. “The second reason I quit was because I was unhappy with my social life. I like girls and chess tournaments are rather male-oriented. The third reason was I did not want to travel so much. Rogoff wants his life to be inspiring, to count for something. 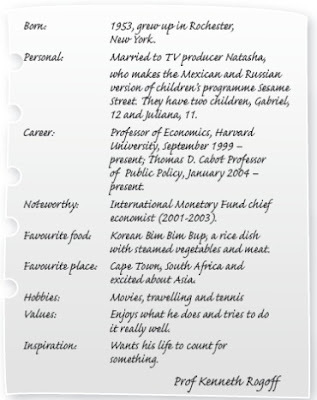 On what motivates him, he says it is important to do things which he finds interesting and enjoyable. “To be creative and successful, you have to enjoy what you are doing. If you do not find the work you do interesting, it is difficult to make it interesting for someone else.